Franciscan University Group Arrives in Israel! 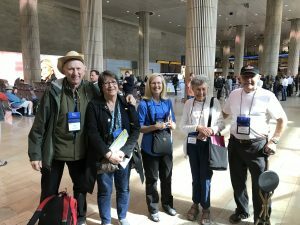 Everyone arrived in Tel Aviv safely and excited. Uneventful departure from the airport and drive up to Galilee. We settled into our hotel in Tiberias and the Sea of Galilee. We had our first Mass on the shore of Galilee. Hear/see Fr. Nathan‘s excellent 1st Pilgrimage homily Here. I am in Rome and decided to run to St. John Lateran this morning a make a video — so all of you could enjoy the Feast Day of the Dedication of St. John Lateran Church on November 9, 313. Yup, that’s right! It was the first Christian church ever built and it was the home of Popes for over 1,000 years. 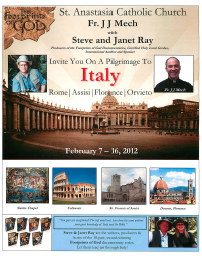 If you want to join us in Rome this February, please call Suzanne at 800-727-1999, extension 121. She can give you info and help you get registered. You will see this church and many more on our marvelous Catholic pilgrimage through the Eternal City. Click HERE for the brochure for our Rome Pilgrimage. Click HERE for the brochure for our St. Paul Cruise with Scott Hahn which ends in Rome. St. John Lateran Church is not just the cathedral for the city of Rome, but it is the MOTHER CHURCH of the whole world. It contains the Pope’s Chair, the Chair of St. Peter. The Church also contains marvelous relics: the cedarwood table Our Lord celebrated the Passover meal on in Jerusalem, St. Peter’s altar which he used as a bishop in Rome. Also there are the skull bones from both Sts. Peter and Paul in a golden reliquary above the high altar on which only the Pope is allowed to celebrate Mass. Enjoy! And be proud to be Catholic! 1. Here is the map with 18 GPS-tagged videos and 93 pictures where I run across Rome and hit many historical sites and beautiful churches. As a guide, I explain many of the sites along the way. 2. Below is the “Tour Videos” just of St. John Lateran Church.